Traditional French foods range from delectable cheeses and desserts to hearty soups, stews, and fresh fish. The traditional foods in any given restaurant or home depend on the region of France. Look for the regional favorites while visiting France if you want to taste the best of the region. French cheeses can make a meal on their own, certainly when paired with freshly baked bread! Cheese has a long history in France of being served after a meal, before the dessert. Cheeses are regional in France, just like wine. While some cheeses overlap between regions, there are particular cheeses that hail from certain regions. In any good supermarket though you can find cheeses of all types, from goat and sheep milk cheeses, to more traditional, hard, aged, cheeses. French cheeses are best paired with French wines. Traditional French soups depend on the region of France. Several popular French soups exist, such as bouillabaisse, which is known all around the world by its French name. Bouillabaisse is a French fish soup that is a specialty of the region of Provence. On the Mediterranean Ocean, it's no wonder that this fish soup features seafood, tomatoes, onions and garlic. The name of the soup comes from the French word "to boil" (bouillir), and the finished product is served with bread, usually to large groups of people. While many soups are not main courses, bouillabaisse is a meal in and of itself. In the center of France, soupe au potiron is a favorite. In the fall, when pumpkins and potatoes are harvested, this soup is featured on many traditional tables. The main ingredients are mixed with cream and topped with croutons or served with a freshly baked baguette. Another seasonal favorite is soupe aux chataignes. Locally grown chestnuts are mixed with potatoes, leeks, and turnips to make a hearty, and yet sweet, winter soup. While this French soup is more difficult to make because finding fresh chestnuts and peeling them can be tricky, it is a great recipe to try for a special occasion. A plain leafy salade verte is the perfect accompaniment to a main course. A salade composée (mixed salad) can be a meal in itself at lunch, consisting of ingredients artfully arranged on a plate and drizzled with vinaigrette, never tossed. Salade Niçoise, a protein-laden standby, is found on menus from Paris to the smallest of villages. 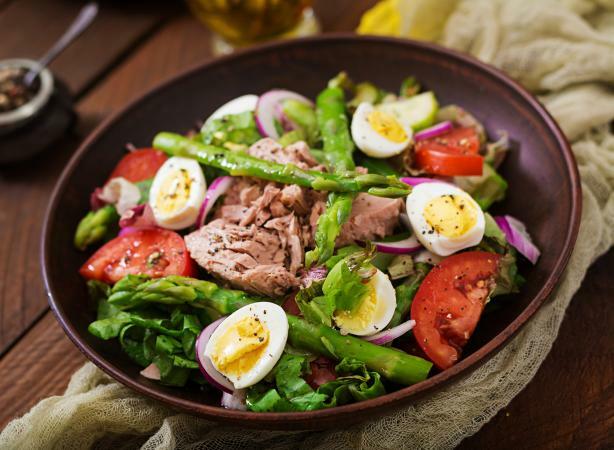 Embellished with tuna, green beans, boiled potato, tomato, hard-boiled egg, olives, and optional anchovies, this classic French salad is named for the Riviera city of Nice. For many, a tasty homemade salad dressing of oil and vinaigrette is the key to a successful salad. 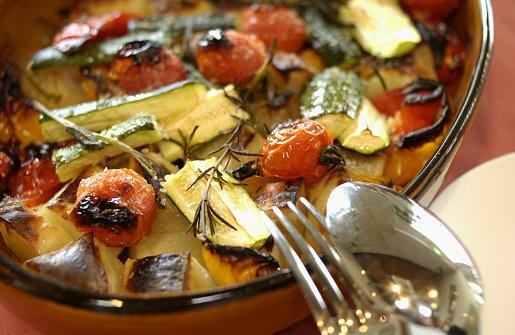 Also with its origins in Nice, ratatouille is a stewed vegetable dish that served as a hearty main course or as a side. Whatever vegetables are seasonably fresh are the preferred ones for this recipe. Eggplant, bell pepper, zucchini, and peeled tomato are all important ingredients. Green beans, asparagus, leeks, tomatoes, onions, garlic and a variety of herbs are among the most popular French vegetables. Cousins of the grilled cheese sandwich, the croque monsieur and croque madame are famous among sandwiches of the world. A croque monsieur is baked ham and melted Swiss cheese sandwich with béchamel sauce and the croque madame variation is topped with a fried egg. Main courses in France often feature meat or fish. The more special the occasion, the more special the meat chosen. For example, a steak may be eaten any day of the week, but on a birthday or holiday, an ostrich or similarly exotic meat may find its way onto the table. Fish is most often served with a cream or butter sauce; all meals are usually accompanied by potatoes of some sort, and vegetables. 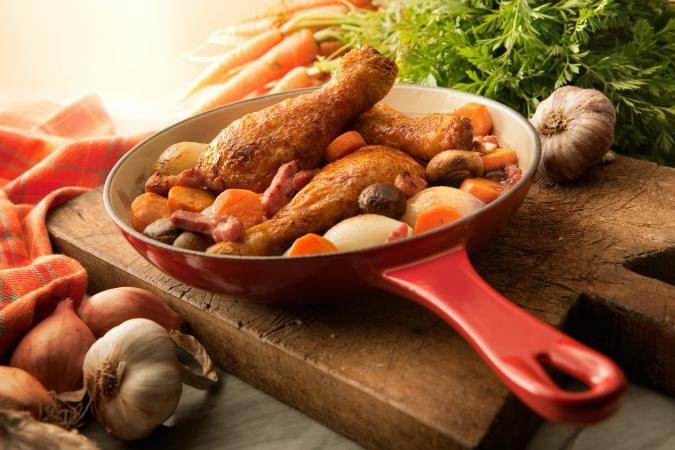 A rooster roasted in red wine, butter, brandy, bacon, onions and garlic is a delectable French treat. This meal takes a lot of prep time, but is sure to impress your guests! A traditional southwestern bean recipe, cassoulet is a perfect winter meal. It has lots of meat in it, but the meat is cut up into the bean dish and simmered. While this taste is not for everyone, it's a truly traditional meal hailing from France. Serve with bread on the side. Mussels are a common seafood served in France. Most often cooked in garlic, the mussels take on a spicy flavor; paired with French fries in most restaurants, this dish is a favorite of French cuisine in many countries of Europe. The variations of fish with sauces are endless in France. On any restaurant menu, a few choice fish selections can be found. Expect to see many different types of fish (and other seafood), each one paired with a different (always delicious) sauce. Sauces can be wine-based or cream-based; each chef has his preferred combinations and secret ingredients. Some say that even if you are not a "fish eater," you might just like the fish in France! Surrounded by seas and ocean, fortunate to have many lakes and rivers, fish is an important food source in France. Grilled tuna provençale, broiled swordfish à la Niçoise, classic sole meuniére, and halibut en brochette need no sauce, as the fresh fish itself is the main attraction. Potatoes are a staple of French meals. While bread is eaten at breakfast and served with cheese after a meal, not all meals are served with bread. Most traditional meals that include a piece of meat as the main course are served with potatoes, whereas soups that are main courses are often served with bread. While this dish features potatoes and cheese, it is rich enough to become a main course on most tables. 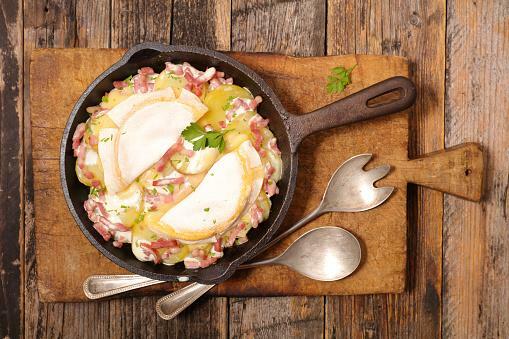 A traditional meal in the Alps, this dish is heavy and warms the body from the inside out with its soft potatoes layered in creamy melted cheese. Potatoes and fish baked together with butter and herbs makes for a fresh potato alternative. Typically southern, the herbs mixed here (saffron, parsley, cayenne) are a new combination for many non-Mediterranean palates. In addition to all these hearty traditional French foods, France has a long history of pastry making and tasty desserts such as crème brulée and chocolate mousse. Bakers offer fine pastries that melt in your mouth, such as profiteroles and mille-feuille. France has a fantastic food culture, and great wine to pair the foods with!